“Ma chère Gabrielle” – Servance, Vosges, January 1918. This card was sent from the Vosges on 31st January 1918. Servance is south west of Bussang, west of the frontier which separated German-occupied Alsace and Lorraine from the rest of France. 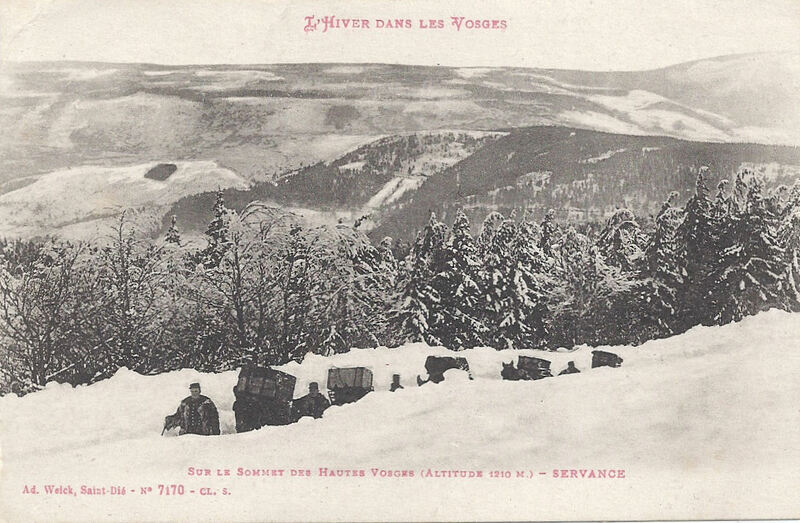 Being based in the Vosges in winter was almost intolerable at times. The cold was intense and men might be on the front line for weeks on end, often with inadequate and cold food. Fires or smoke, clearly visible in the snow, would give away positions so food was cooked behind the lines and carried forward, and in bitter cold it spoiled en route. In any case, mule-trekking supplies through forests in deep snow was fraught with problems. The card is written in idiosyncratic, often phonetic French and I am very grateful to the people mentioned below for their help in translating it. I am writing these two [words?] to you in order to let you know that I am in good health, and I hope that when my card arrives it will find you the same. Now, today I haven’t received a letter so far. Perhaps I’ll have received one by tonight. I can tell you that I left Tillot* and I am presently at Eternue**. I wanted to send you a card of the place I am in, but there aren’t any. So, I’m sending you this one to show you the trenches when it is snowing. The snow is the same where we are, and as for the life of the soldiers in wintry weather, no need to tell you that we feel the cold! But, at the moment, a lot of the snow is gone and we are left with white frosts, so it is cold. I finish my card by sending kisses to the two of you. * I believe this refers to le Thillot, about 10 km north east of Servance. ** I don’t know where “Eternue” refers to. I’m very grateful for the help of Jack Sheldon, Steve Marsdin & his wife (apologies, I don’t know your name) and Martin Bennitt for unravelling the text of this card.